Somewhere at the intersection of memoir, fine art and illustration sits "Graphic Lives," a four-artist installation that opens this week at Burlington's New City Galerie. In using the medium of illustration to represent events and ideas from the artists' lives, the show calls into question the standard definitions of "memoir" and "comics." Vermont artists Glynnis Fawkes and Alex Costantino are joined in the show by New York illustrator Summer Pierre and New Jersey cartoonist Jennifer Hayden. Even though — or perhaps because — all the artists' styles are distinctive, the artworks in "Graphic Lives" combine to suggest possibilities not traditionally associated with comic art, or with the memoir genre. Fawkes' willowy illustrations draw on her experiences in art school, as well as on the classical myths she has studied and taught. Pierre specializes in single-page comics about complex subjects and people, including herself. Hayden uses pointy-nosed characters (which evoke those of Vermont Cartoonist Laureate Ed Koren) to tell the story of her battle with breast cancer. Costantino's is the most unconventional work, combining not only comics and memoir but also ceramics. 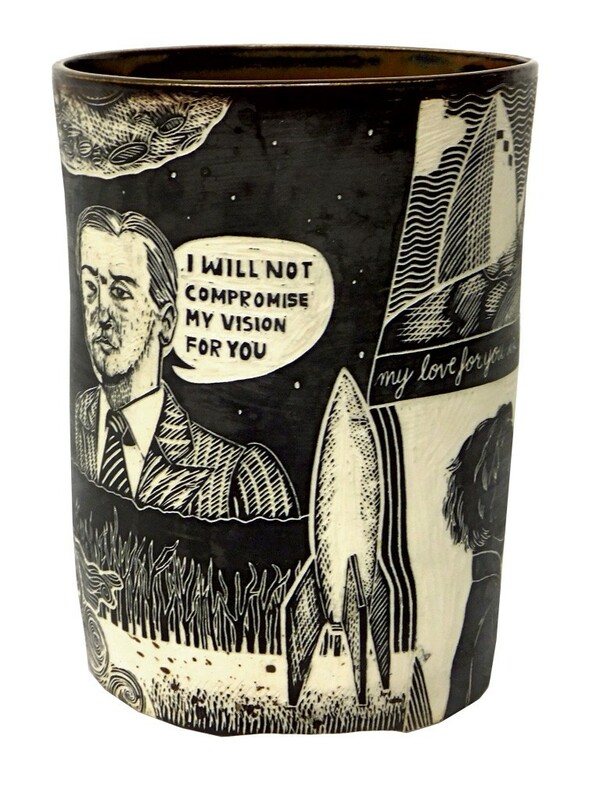 He makes jars and pots etched with scenes that unfold in frames akin to the panels of a comic. "These are lives, expressed using these unique forms," says Joseph Pensak, the show's cocurator and director of New City Galerie. "They're stories, and each life is a collection of stories. Sometimes those stories are scattered and not fully formed; some are so clear that they can be depicted in six panels." The combination of comics and autobiography is a more and more common — and savvy — union. Recent graphic memoirs such as Roz Chast's Can't We Talk About Something More Pleasant? and David Small's Stitches: A Memoir have appeared regularly on best-seller and end-of-year lists, as Alison Bechdel's Fun Home: A Family Tragicomic did before them. A January Publishers Weekly article on genre sales trends from 2013 to 2014 lists the second-biggest climber in nonfiction as biography/autobiography/memoir (up 12 percent); meanwhile, graphic novels made the biggest sales jump in the fiction category, with an increase of 15 percent. For Fawkes, it was natural to use cartoons to depict events from her own life. "My memories are as visual as they are verbal," she says. "I could just write the story — Once upon a time, I did this — but I can't help but think of events that happened as very brightly visual, so that's the way I want to capture them." Fawkes and Colchester artist Elise Whittemore came up with the idea for the show; both are, with Pensak, its cocurators. Fawkes knows Hayden and Pierre from comics expos; Whittemore, a friend of Fawkes and an admirer of her work, brought Costantino's work into the show. "Seeing how comic artists create stories with text, visuals and design really intrigues me," says Whittemore. "I admire this form that pulls all these things together." Pensak's approach to the show's subject matter is to treat it as a kind of folk art that is both accessible and profound. "Graphic Lives," he says, offers "points of entry for anyone to discover the artists, and to dive in deeper." The artworks in the exhibit have no shortage of either of these qualities, which may be their appeal. Hayden's panels, for instance, bring to mind familiar newspaper comics of previous decades but address the subject of life-threatening illness. Fawkes' work is lissome and instantly engaging, yet its pictorial grace is countered and enriched by its multifaceted story about an artist finding her creative identity. Pensak returns to the idea embodied by the show's title. Though no artist can depict every single event or thought in his or her life, he says, "through a very specific story, [they] capture a life. It's not a whole life, but it's nothing less than a life." The original print version of this article was headlined "What's So Funny? Artists Depict Their Lives Through Comic Art"